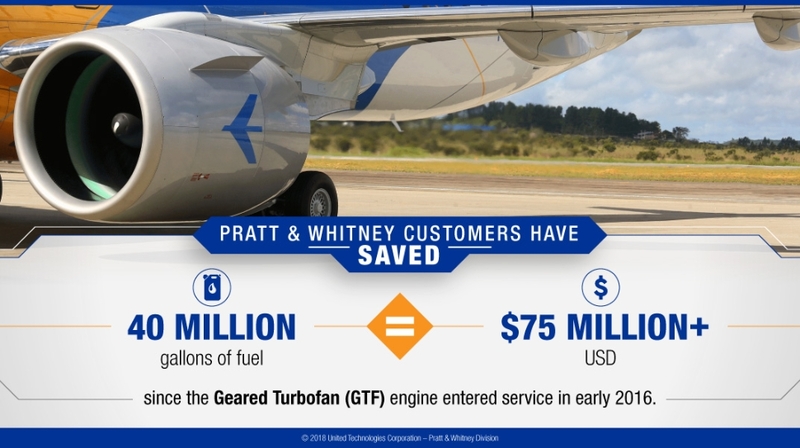 Pratt & Whitney customers have saved an estimated 40 million gallons of fuel worth more than $75 million USD, avoiding nearly 383,000 metric tons of carbon dioxide emissions since the Geared Turbofan (GTF) engine entered service in early 2016. That’s equivalent to the energy use of 41,000 US homes for one year! The Pratt & Whitney GFT engine has also demonstrated its ability to reduce fuel burn by 16 percent, to reduce NOx emissions by 50 percent to the regulatory standard, and to lower the noise footprint by 75 percent. As more GTF engines enter revenue service this year, the outlook for 2018 remains bright. The GTF engine program is continuing to attract new orders and is ramping up production deliveries, all while supporting a growing in-service fleet. This article contains forward-looking statements concerning future business opportunities. Actual results may differ materially from those projected as a result of certain risks and uncertainties, including but not limited to changes in levels of demand in the aerospace industry, in levels of air travel, and in the number of aircraft to be built; challenges in the design, development, production support, performance and realization of the anticipated benefits of advanced technologies; as well as other risks and uncertainties, including but not limited to those detailed from time to time in United Technologies Corp.’s Securities and Exchange Commission filings.